The card that’s not afraid of a little hard work. At HammerHead, our goal is to make sure you have the right equipment when you need it. 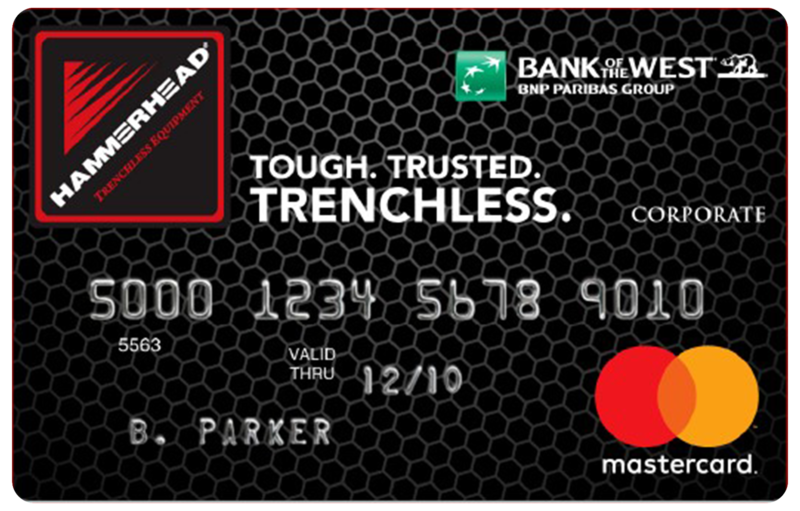 That’s why we’re introducing the new HammerHead® Mastercard® from Bank of the West, the most convenient way to pay for trenchless equipment, parts and accessories. This dedicated commercial credit card makes it easy to consolidate and track HammerHead purchases and helps you better manage your company’s cash flow–giving you more time to focus on your business. Plus, you can look forward to ongoing, money-saving financing offers–reserved only for account holders. In short, it’s the card you can count on to get the job done. *All credit is subject to approval by Bank of the West. Mastercard is a registered trademark of Mastercard International Incorporated.